Formative assessment is gaining an increasingly brighter (and very worthy) spotlight in the K-12 community. As more and more schools and districts make the move to a growth mindset and mastery learning, formative assessment may be the most powerful tool to help teachers identify strategies to improve their own practice, while providing students with the personalized attention they need to succeed academically. Like the name implies, formative assessment helps guide learning and instruction by providing immediate student feedback while learning happens. Unlike summative tests, which typically occur at the end of a chapter or unit, formative assessments are usually ungraded or don’t carry heavily weighted points.Rather, formative assessment is a quick check for understanding to help teachers answer important questions about student growth: What do my students know? What do they still need to learn? How should I adapt my instruction? 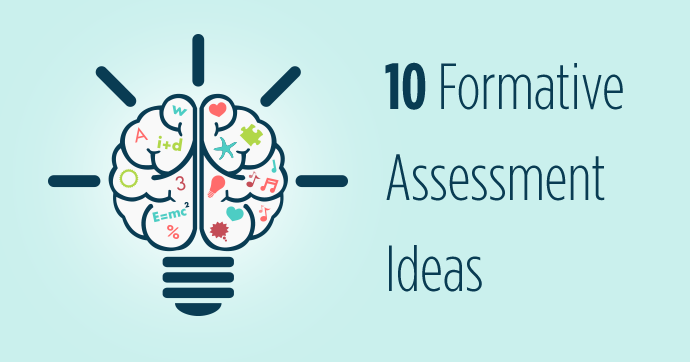 Read on as we break down 10 formative assessment examples you can start using in your classroom now. A modern take on the time-tested exit ticket, this formative assessment technique asks students to share their understanding at the beginning of class. Have them jot down what they learned from the previous day’s lesson, share how they’d apply what they learned in a real-world scenario, or ask questions they may have about the material. Use strips of paper, index cards, or an online solution like Socrative to gather student responses. Then use their responses to answer questions at the beginning of class, re-teach an important concept, modify the day’s lesson, or determine if the class is ready to forge ahead. Asking questions that require more than simple yes-or-no responses encourages students to use their higher-order reasoning skills. Additionally, when students are asked questions like “Does this make sense?” or “Do you understand?”, they may answer “yes” even if they need more help. Ask questions that make them think more deeply about the class material. You may use these questions to start students talking as a class, begin small group discussions, or utilize as a writing prompt. This will help them make the transition from memorizing to cognitively processing their response. This formative assessment strategy works particularly well for history or social studies students, but can be used in other context like ELA or current affairs. Ask students to take on the persona of a historical figure, a fictional character from a novel, or a person in the news to write a postcard to another individual. Students should think beyond the historical facts, such as dates or locations, and more closely consider context, causes and effects, and other social factors. You may, perhaps, choose to provide them with a series of questions to help them get writing. Peer review and collaboration are another way to implement formative assessment in your classroom. Allowing students to see others work not only promotes collaboration, but may further their own understanding of the material. This K-12 assessment strategy works well for many assignment types, including oral performances, written assignments, or art pieces. After discussion of the work, ask each student or group to write down two stars (areas where the work excelled) and a wish (an area where it may be improved) about a peer’s project or essay.This formative assessment example is designed to keep things positive, while still providing each student with constructive feedback. Assessing each student’s level of understanding at the conclusion of class time can help you prepare for the next day’s lesson or determine if you need to assign additional activities. Asking them to put their thoughts in writing will also save you from the dreaded silence that can happen when asking for their questions aloud. At the end of a lesson, encourage students to itemize three things that he or she didn’t understand about the material. Students may write down their responses or send them electronically via a classroom edtech system. After writing them down, you may also ask them to share their questions out loud to provide an opportunity to receive peer feedback. For younger grades, hold “carpet time”, when students sit down to go over questions as a group. Formative assessment can be fun and games when you add in a little friendly competition. The activity not only adds a layer of excitement to learning, it promotes teamwork and collaboration among students. To hold a bowl of your own, separate the class into teams. Use a buzzer, bell, or raised hands for teams to answer, with each correct answer earning the team points. Our personal favorite, of course, is holding a Socrative Space Race, during which students race their icons (even unicorns!) across the screen. Spark creativity in your students by asking them to create collages with a mix of images they believe demonstrates their understanding of a concept. This formative assessment idea can be used in nearly every subject for any age group, and can be done individually or in groups. Ask students to present their collages to the class and explain why they chose to include each image. Allow students to ask questions or provide feedback. Or hang collages on a gallery wall where students can view others’ work. Singling out an individual can cause anxiety for the student. No student, after all, wants to hear, “See me after class.” However, when teacher-student meetings are scheduled as a standard among the entire classroom, it can promote learning while sparing any unintended embarrassment. This formative assessment activity can be particularly helpful for introverted students who may be too shy to speak up in front of a group. Meet with each student, perhaps even for a few minutes or once per week, to discuss a specific assignment or concept or to allow them to ask questions or receive feedback. Scheduling these meetings while the rest of the class is working on a project ensures learning continues for all students. A twist on the all-time formative assessment classic (raising hands) “fists to fives” or “thumbs up / down” allows students to communicate their level of comfort with the day’s materials with an easy visual cue. Ask your students to quickly show their understanding with a numerical rating or with a simple thumbs up or down. Or, if you have a tech solution, ask them to send in their rating anonymously from a laptop, tablet, or hand-held device. Although you may already have chapter or unit-end quizzes planned, a quick-check quiz—or even a single question—will give you valuable insight into student growth before moving on. Be sure to keep it informal to alleviate pressure on students. Ask students to answer questions that will demonstrate their mastery of material. Their responses will help you determine if it is time to move on, divide students into groups, provide more examples, or identify students that needs a little extra help. If you’re a formative assessment fanatic, share your strategies with us on Twitter, on Facebook, or at blog@masteryconnect.com. We’d love to hear how you’re helping students conquer the world! MasteryConnect provides K-12 web and mobile solutions to help educators visualize student levels of understanding in real time, so you can more easily use formative assessment data to drive student outcomes. Ready to talk to about how we can help your school or district? Let us know!